Woohoo!!! My first post.. I already lost count of the blogs I've started.. But this is it. I'm ready to share with you my Pursuit of Wifey-ness. So.. in the course of my boredom, I came up with one of my crazy ideas. I came up with my own Category of Wives. WHICH ONE ARE YOU, OR WHICH ONE WILL YOU LIKELY BE? I'd love to hear from Type A/1's and E/1's YOU. A - Ultra-Domesticated - spends her time doing Martha Stewart things.. sewing, knitting, cooking, baking, loooves doing household chores. B - Semi-Domesticated - a housewife like me who spends her time Facebooking, Watching TV, googling about recipes, and takes pleasure in cooking a sumptuous meal, baking a lip-smackin' cake, but sometimes groans over other household chores. Could be more inclined to have own business. C1 - Undomesticated, not working - A lucky wife who perhaps has maids (or husband) at her beck and call. Spends her time in the parlor, spa, gym, and in shopping malls. 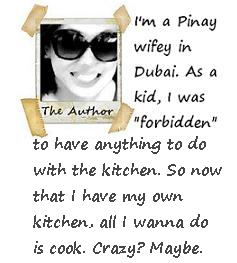 C2- Undomesticated, Career Woman - A wife who probably has a not-so-tidy house.. feeds her family mostly instant meals and take-aways... Lucky is she who has a domesticated husband who does the usual wifely duties. E - Domesticated, Career Woman - A well-rounded wife who earns her own shopping money, keeps a clean and organized house, feeds her family delicious healthy meals, and knows how to make them happy. WOW. 2. Wives who don't know the extra stuff that #1 knows. How about me... a Domesticated Career Woman to a T, BUT with one MAJOR flaw: Out of whack laundry schedule (or lack thereof), so crazy the hubs would end up wearing good shirts to bed because PJs are forever somewhere in middle of the pile. Waaaaaah!